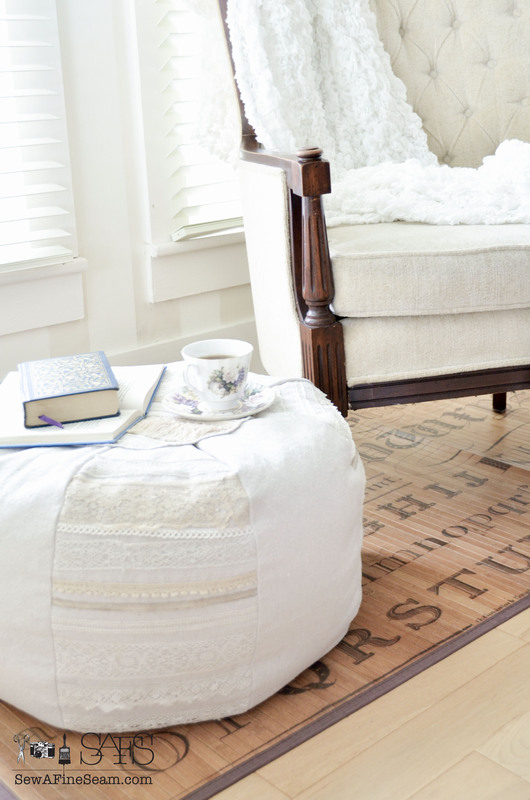 When you live in an old house that was built over 100 years ago – you have no storage. Therefore you have to woman up and invent your own ideas when it comes to the task of creating storage and organization. Well today is a different era. And I require storage. And since starting my own business I need a LOT of storage. In fact the business is taking over a lot of our living space. We really need to do something different but we keep making do with what we have as we continue to consider our options and decide what we want to do. Be sure to check out my friends organization posts too – I’ve linked them all at the bottom of this post! This cabinet used to be a tv armoire – you remember the ones – the big orange oak beasts that housed the huge tv screens back before the days of the flat screen. 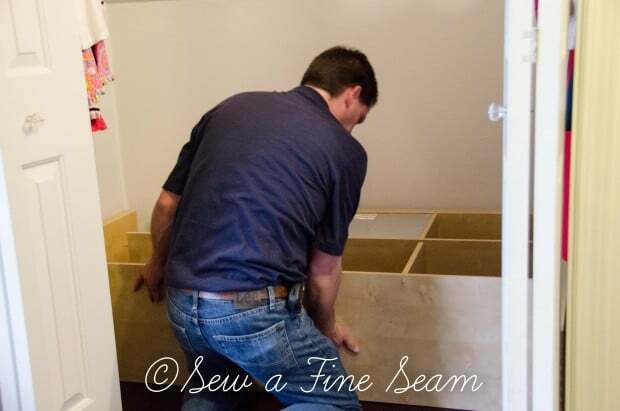 My husband gutted out the interior where the tv used to sit and added shelving so I can store my fabric in this cabinet. I painted it with milk paint. I have a lot of ribbon. I love ribbon and sometimes go overboard when ordering it or when I find a stash at a garage sale or thrift store. This is what one pile looked like before I created a bit of organization for this stuff. Now my ribbon hangs where I can see what I have and I can get to it easily! This DIY ribbon organizer took about an hour to make including getting the ribbon hung. (that hour did not include going to the store to buy the supplies I didn’t have on hand) This is so great for me in my limited space – it’s on a wall that wasn’t really a good spot for anything else and it frees up the area I was using to stuff all the ribbon. 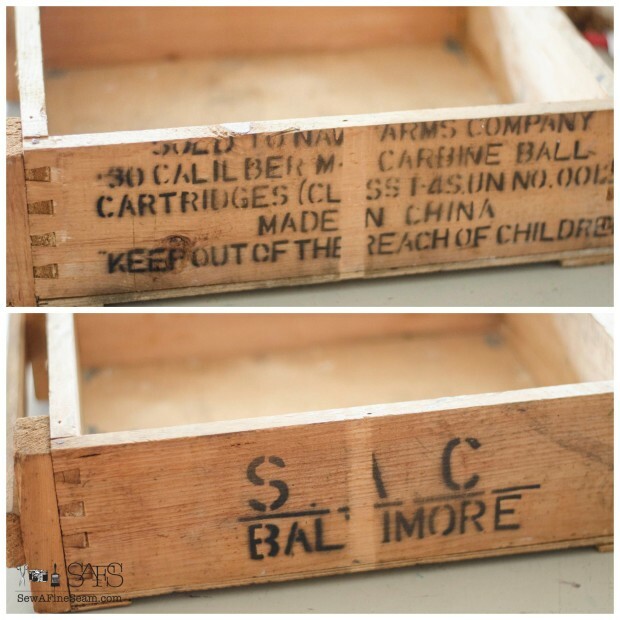 This old ammunition box got a bit of a makeover and became one of my favorite storage solutions ever. I am still using it and love it! As I’ve already said, houses built in the late 1800’s just didn’t have an abundance of closet space! There was one, teeny-tiny, totally insufficient closet in one of the bedrooms. We tore it out and built nice-sided closets in the bedrooms that we gutted and gave complete makeovers. In a couple other areas of the house we have added old lockers to create some storage space. I love the look of the lockers and their vintage industrial appeal. And they have doors that close to hide the mess of stuff that gets shoved into them. We took advantage of the large space we had created inside the closet and added storage solutions there. 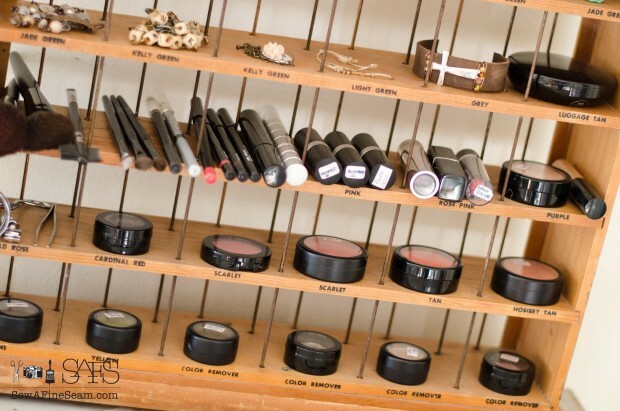 Another favorite is this awesome vintage piece I repurposed into storage and organization for my makeup AND my jewelry. This thing has been a lifesaver. This metal cabinet is another piece I really really love. 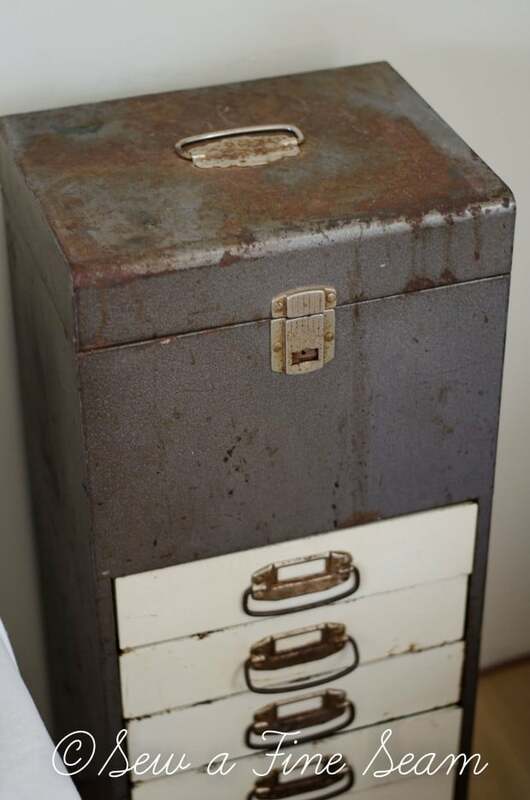 It’s got great vintage industrial patina AND it has storage! The top opens with room for my files for keeping business paperwork and the drawers hold all manner of papers, books, odds and ends, and the tv remotes when I want them out of sight! The top holds a lamp with just enough room left for my coffee cup – this piece sits right beside the chair I sit in to drink my coffee and do my blogging and other on-line work. It’s a great piece! And now that I’ve shared a few of the ways I create storage and organization in an old house that came without storage, hop on over to see what my friends do to be organized! Jill, Love the lockers for storage what a great idea along with how you have your ribbon stored. The ribbon thing has been great. I don’t always get my ribbon put back right away after using it for a project but it’s great to have a place to put it when I do get around to organizing – and I love being able to see what I have at a glance. Love all your great ideas for storage. I love dual duty pieces. Can’t get enough storage as far as I’m concerned. Love your armoir and ribbon storage. 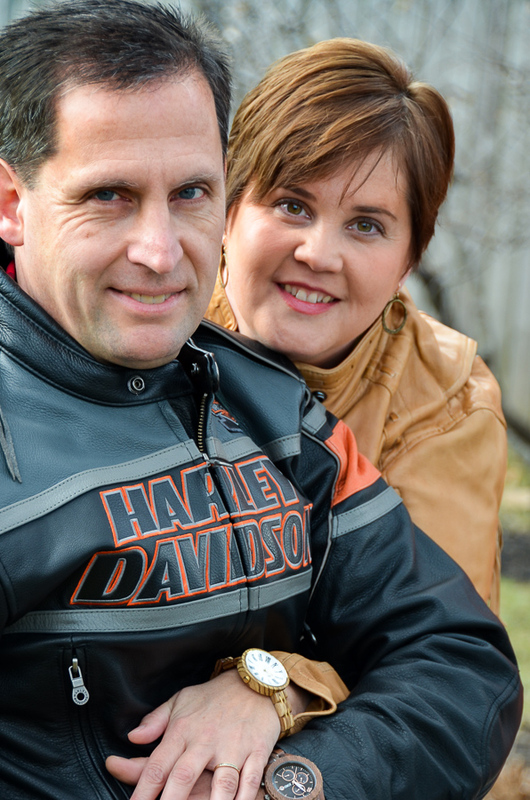 Thank you Cathy – I agree there is never too much storage! I got very lucky with the lockers Kathleen – both sets came from schools around here that were building new and had auctions. We got them cheap and I love them. If I were building a house I would order sets of brand new lockers for some spaces in my house because I love the look and the storage. Great ideas, Jill. I have a 20 year old armoire that I bought with my bedroom set. It has room for a TV but I now use it for storing blankets, pillows, tablecloths and other household items. I like how you stored the ribbons. I also have accumulated a lot of them over the years and currently have them in a large bag. 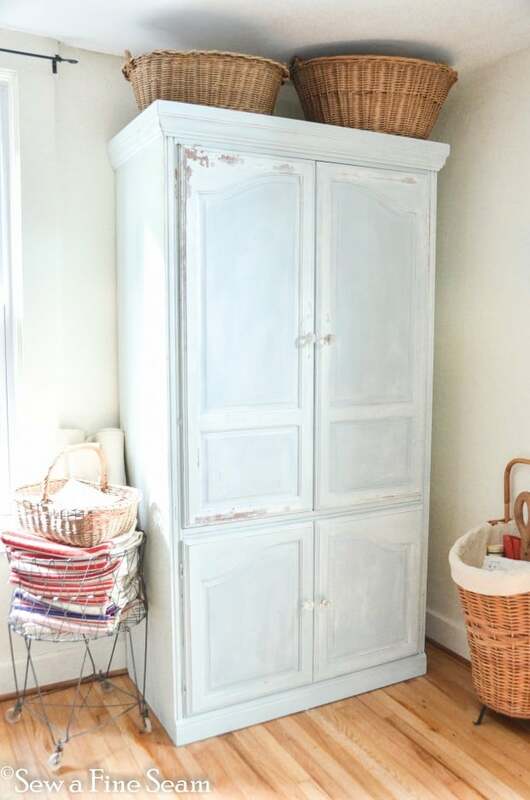 Those big armoires can be great storage for lots of things! Groan, seeing your armoire makes me want to kick myself for giving one to thrift store few years ago. What was I thinking? NOt smart like you and use it for storage. Problem is unlike your house no room for it, was too big and bulky. You’d think could have thought of someplace to keep it tho huh? 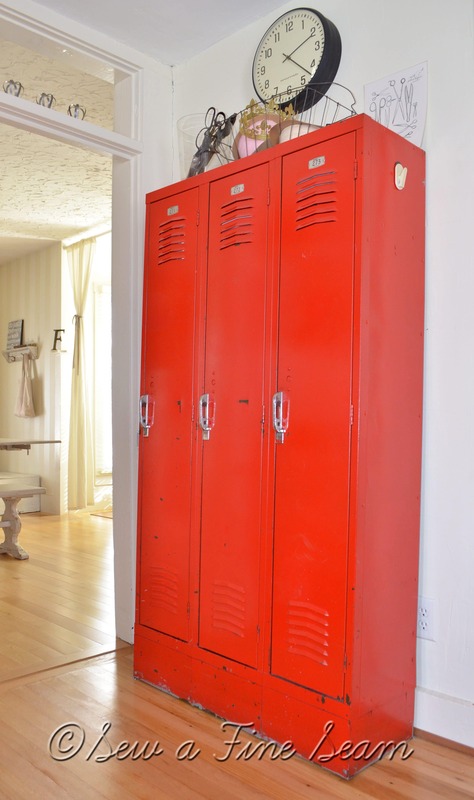 Absolutely want those wonderful red lockers you have, now that’s some awesome storage also, smart girl. Great ideas Jill, you are so smart and talented. 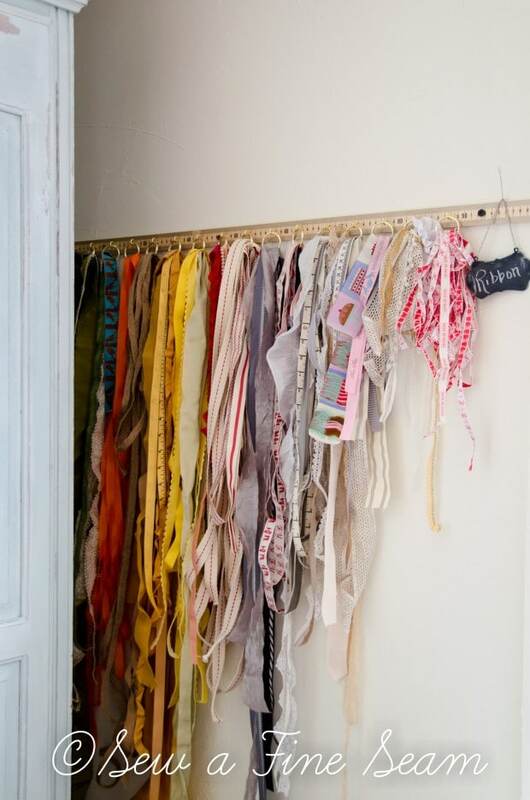 Love how you stored your ribbons. It’s so handy so you can see what you have at a glance, so helpful in middle of a project. Few years ago hubs put couple shelves in my sewing room on one wall, the room is smaller than most people’s walk in closet. I keep my ribbons, some of them, in two big plastic drawers. The rest of ribbons, Christmas, go in smaller plastic drawer unit. Older houses are bad about having storage aren’t they? So are single wide mfg. houses. Glad you have such a handy hubby to make things for you, seems like we’re always needing more and more storage. You always seem to figure out a great solution to lack of storage and it looks fantastic on top of it. How is it going with your space at store in town? Are things selling well there? You take such great photos of everything it’s nice to see all you do. Thanks for coming by JaneEllen, hope your therapy went well and you are getting more movement in your arm! These are such wonderful ideas!! I love how most of them are decorative as well!! I love every one of these and how decorative and display worthy most of them are. Thanks for the ideas!! For some reason the comments don’t show up immediately Michele – sorry about that! Hi Jill! These are great ideas! I am heading to an Antique show in May and will definitely be looking for a set of lockers like that one. Super cute! Thanks Colleen, and I hope you find a great set of lockers! I loved seeing all your great storage ideas! 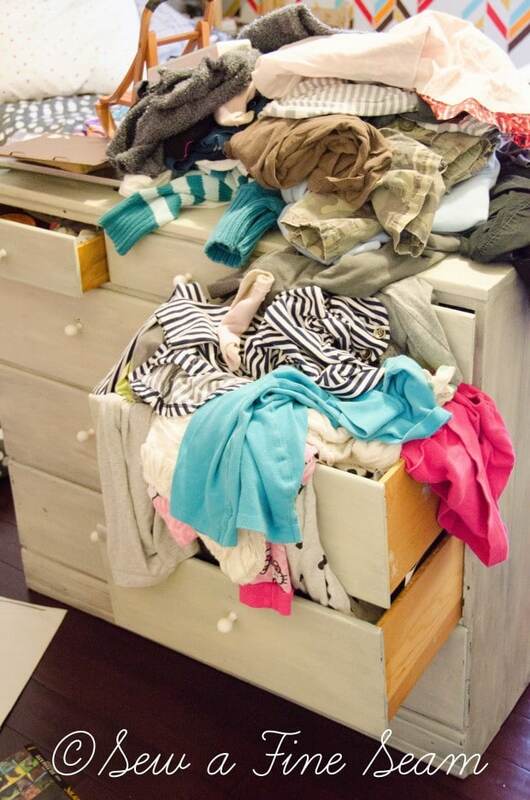 I think when one is into crafting and DIYing it sometimes doesn’t matter even if you do have large rooms and/or closets… it still isn’t enough room! lol! That’s what’s happened to me! I have SO MUCH STUFF that I don’t have enough room! 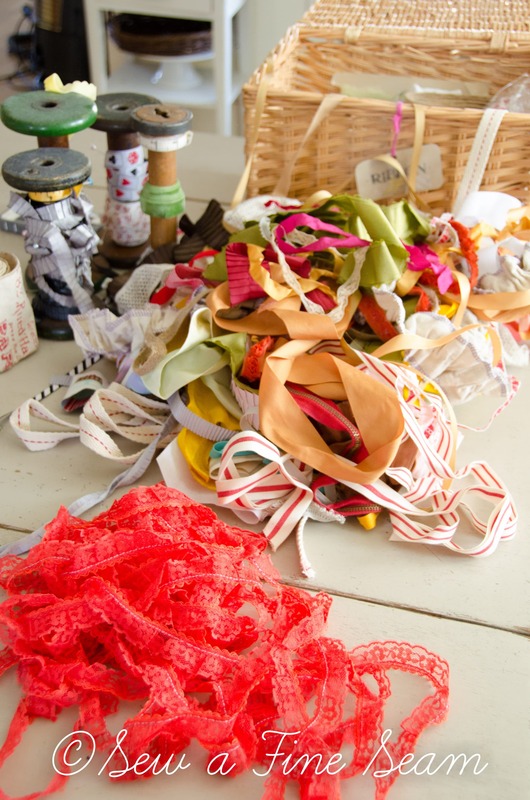 I am purging and getting ready to redo my craft studio as soon as that hard task is over! We used to live in a very old home. As beautiful and stately as it was, there was zero storage. We had to get very creative, to the point that when we moved to our new home and I got my first ever walk in closet I had no idea what to do with it! Thanks for sharing your creative ideas. 🙂 Old houses have tons of great character – but you do sacrifice some things for that character!